Beautiful Subwoofer cabinet , eye catching driver that outperforms many larger subwoofers thanks to the technology and engineering put into it. I have owned multiple subwoofers like the Velodyne spl 10,12 and 15. It obvious won’t outperform the the 12 and 15 Spl subwoofers raw output , but much faster and more accurate. 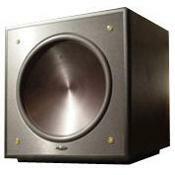 The Minivee, cht, Dps , Pargidam UltraCube 12” Aperion bravus 12,Defintive Technolgy subwoofers and many others . Those big box store junkie Subwoofers are not even in its class. The bass is always tight , crisp without distortion, thanks to its quality built cabinet and bandpass designed. It screams out quality with dual chambers design and multi-layered drivers , separate chamber for amplifier . Engineering technology is just mind blowing that they have incorporated into this Subwoofer driver system . You will notice new low frequency’s you have never heard before and some that were distortion will be gone . The cabinet has a furniture quality finish that can easy get scuffs and scratches from just lightly bump into walls or furniture They do buff out with a little wax or a dry soft cloth. Most home theater or listening rooms are usually enjoyed in a low light environment where the are not noticed . Very fast response, rich chocolate lows, not in the least bit boomy, solid construction. A great sub for music. Although I enjoy movies, I am more interested in listening to music. After casually shopping around for a sub that would complement my Sonus Faber Concertinos, I came across the James brand by way of strong recommendation at a store in Manhattan. Not only was I impressed with the sound in the demo rooms, but the salesperson showed me several reviews from magazines that corroborated his enthusiasm. I did some more research on my own and returned to purchase this little powerhouse. The construction is solid…probably weighs 70 lbs. More importantly, the response time is very fast and does what a sub should do…subtly complement the mids and highs without being overbearing and a distraction. The bass is deep, rich and not in the least bit boomy. This is my third sub. I previously had a small Rel and a Cambridge Soundworks starter sub. In my opinion, the James is superior to the Rel, which at times sounded a little boomy and behind the actual timing of music sequences. The size is similar to the Rel…perhaps slightly larger…I actually made the switch without my wife noticing…LOL. I listen to everything from classical to Metallica, Led Zep to the Carpenters, Loreena McKennitt and Tori Amos to classic jazz and flamenco guitar. I am very pleased with this product, and I would strongly recommend it…especially to a hybrid music lover/Home Theater enthusiast.